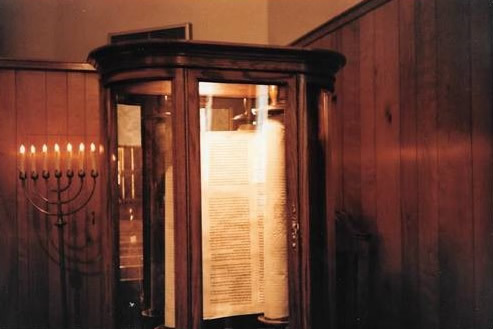 The Czech Torah MST#550 in the display case comes from the Pinkas Synagogue in Prague, Czechoslovakia. This Torah is from a large collection of Judaica brought to the Jewish Museum in Prague from the 350 Jewish Communities in Bohemia and Moravia. This scroll is on Permanent Loan from the Memorial Scrolls Trust www.memorialscrollstrust.org a non-profit foundation which is responsible for the 1,564 Torah Scrolls that came to the Westminster Synagogue, London in 1964. Mount Zion has installed this display and dedicates it to the six million Jewish people, including 77, 000 from Czechoslovakia, murdered by the Nazis. Scroll MST#550 is three feet tall, with parchment rolled on the wooden spindles, normally referred to as the Etz Chaim, Tree of Life. The klaf, or parchment is stained from abuse, and for that reason the Torah will be on display only and not used in worship, although the Hebrew script is bold and letter-perfect. 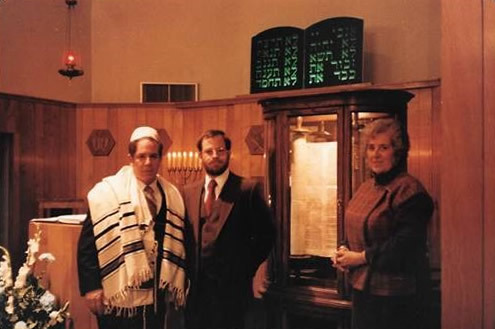 Mount Zion undertook to assist in the care and preservation of a Torah scroll after one of our members, Joyce Nauen, visited London in 1980 and saw the Memorial Scrolls Trust’s work in repairing and distributing these Torah scrolls. 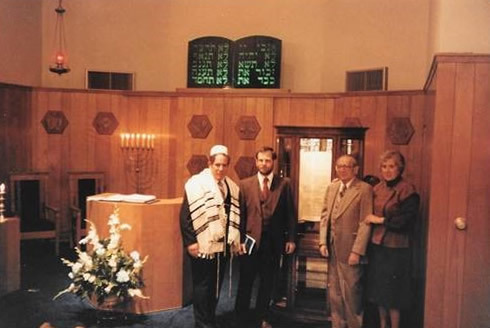 It is important that we remember, and we believe that the Torah will be a symbol, as a warning of what human beings are capable of doing to one another. At the same time, it serves as a memorial to those lost souls. This Torah survived, and the Nazis did not. The Pinkas synagogue in Prague was built in the 1200s so the Torah could be extremely old, definitely in excess of a hundred and fifty years.